For the most part, many of us snack. And, snacking can be part of a healthy diet. However, it can also be the biggest downfall or troublesome part of one’s diet. Some people graze throughout the day. Some people have a snack or two. And some never eat outside of their three meals per day. None of these options are necessarily right or wrong, but there is a wide variation of how people approach snacking. Call me biased, but I think it is incredibly cute. And I am like many of you and think, “Goodness, what are we going to have for a snack today?” That’s because when I menu plan for the week, I sometimes forget to plan ‘nacky foods! With that being said, I thought it was time to share my top 10 recommendations for healthy snacking. Per the request of my sister-in-law, Linda, I made sure some them were snacks you could purchase right from the grocery store with minimal or no prep time. Because I know none of us want to slave in the kitchen for meals and/or snacks each day. When someone asks me about my favorite snack, this is often the first that comes to mind. I love Larabars since you can conveniently get them from so many stores--sometimes even gas stations! The bars are minimally processed, include only whole natural ingredients, typically have six or less ingredients, and of course taste delicious! My daughter loves these, which is great, because we can easily throw them in the diaper bag for both me and her. Since Larabars can be a *bit* pricey, depending on where you buy them from, we most often get them from Thrive Market since you can always get them for about $1 per bar. P.S. I’m currently digging the cherry pie flavor! I can’t believe how many different varieties of hummus you can find these days! 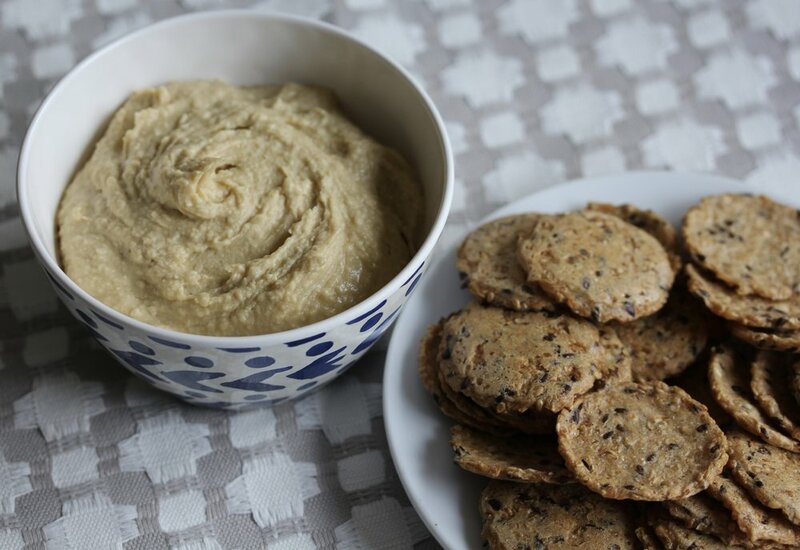 Since the primary component of hummus is chickpeas, it adds fiber to help you feel full longer while, of course, coming with multiple disease preventing properties! You can dip whole grain pretzels, crackers (i.e. Mary’s Gone Crackers), or cut up raw vegetables. P.S. I’m currently digging the roasted red pepper hummus! 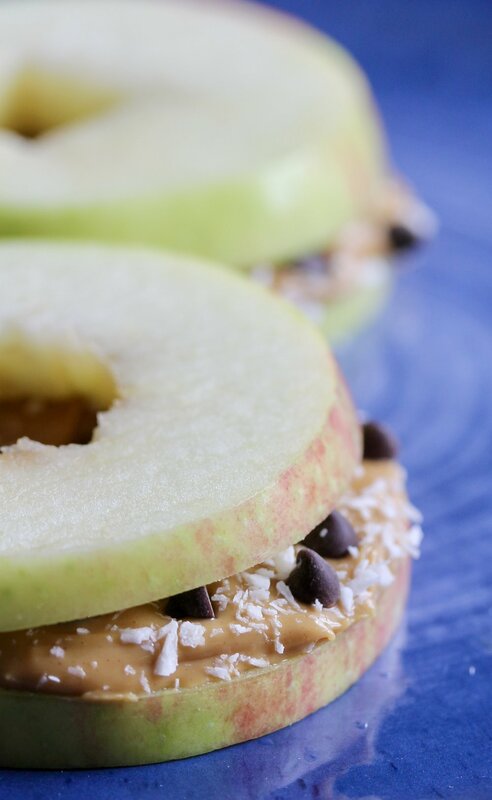 If you have kids at home and want more of a ‘fun’ snack, apple donuts are great! I’m not referring to the traditional donuts you might be thinking of (but trust me, I do love me a good donut). I’m referring to an apple cut into rings with natural peanut butter spread between two slices and sprinkled with coconut flakes, dairy-free dark chocolate and maybe even a little ground flaxseeds. If you feel like being an adult, just slice the apple and add all the toppings to a bowl and scoop. P.S. I totally dig honeycrisp apples over any kind! These muffins are the most popular recipe on my website. You can whip them up within 25 minutes (that inclides the baking time). They are little bit more of a sweet treat than a snack but you can choose to eliminate the chocolate chips and use walnuts instead. P.S. To save time, when bananas get too ripe for my liking, and before freezing, I peel and mash them. Then, when it’s time to make the muffins, the mashed bananas defrost quickly and are ready to use. Fruit pressed bars are pretty yummy! From a nutrition perspective, they are better than fruit leather since they contain fiber. When consuming fruit products, you want to make sure it includes fiber! Fiber is what naturally regulates blood sugars, improving insulin sensitivity, and providing more satiety (or, the feeling of fullness). There are several brands which make pressed fruit bars, such as ‘Pressed by KIND’ or “That’s It”. They make for an easy diaper bag snack on-the-go. P.S. While writing this blog post, I noticed that KIND now makes a Dark Chocolate Strawberry Pressed Bar. I’ll be on the lookout for these when looking for more of a dessert! If you like chickpeas and you haven’t tried homemade roasted chickpeas as a snack, you’ve got to try them! If you love salty and crunchy snacks, the store-bought roasted chickpeas will be more your style. An example would be something like these. Personally, I find the store bought roasted chickpeas to be too crunchy. Therefore, I prefer to make my own so I can control how crisp they get. You can get roasted chickpeas in a variety of flavors, whether you are purchasing them or making them on your own. P.S. To make them on your own, use one can (15.5 ounces) of no-salt added chickpeas. Drain (don’t rinse), add to cookie sheet lined with parchment paper, season with salt & pepper (or, desired seasonings). Roast at 350 degrees until your desired crispness. Mine is about 15-20 minutes. Ah, avocado toast. A great piece of bread toasted and smothered in avocado. And for me, with a sprinkle of coarse ground black pepper. Who says toast has to be just for breakfast? When I was pregnant, toast was an all day affair! And if you regularly watch Fixer Upper, yes Chip Gaines, avocado toast is a thing and people love it! If you have trouble finding the perfect avocado, I recently went Facebook Live to give you one of my favorite tips for picking an avocado. P.S. I’m totally loving avocado toast with a sprinkle of Trader Joe’s Everything But The Bagel seasoning and ground turmeric. Just like avocado toast isn’t just for breakfast, potatoes aren’t just for meal times! Occasionally, I’ll dice up and roast sweet potatoes for a snack while Baby Girl and I watch Ellen. The roasting component is a little more time consuming, so if you’re looking for a quicker snack, scrub a potato (sweet or other variety), cut an ‘X’ into the potato, and microwave. Viola! P.S. If you want to see how I make my sweet potatoes, I shared my recipe for “Sweet Potato Wedges”. Baby Girl loves these and while I make them she desperately looks up at me and says “Tatos...tatos…”. Yogurt is a big love for many, case in point, my husband. He once told me that if he had to choose one food to eat every day for the rest of his life, it would be yogurt. Whoa. Whoa. Whoa. I totally disagree! (Where are my peanut butter and chocolate fans?!) However, I do enjoy a yogurt parfait every once in a while. Personally, I enjoy the almond-milk yogurts topped with fresh berries and about two tablespoons of granola. P.S. Be mindful of how much granola you add to the parfait. The calories can quickly add up, which is why I recommend limiting it to no more than two tablespoons. Additionally, be mindful of how often and which non-dairy yogurts you are consuming. For example, almond and coconut yogurts tend to be high in fat and some are high in added sugars. 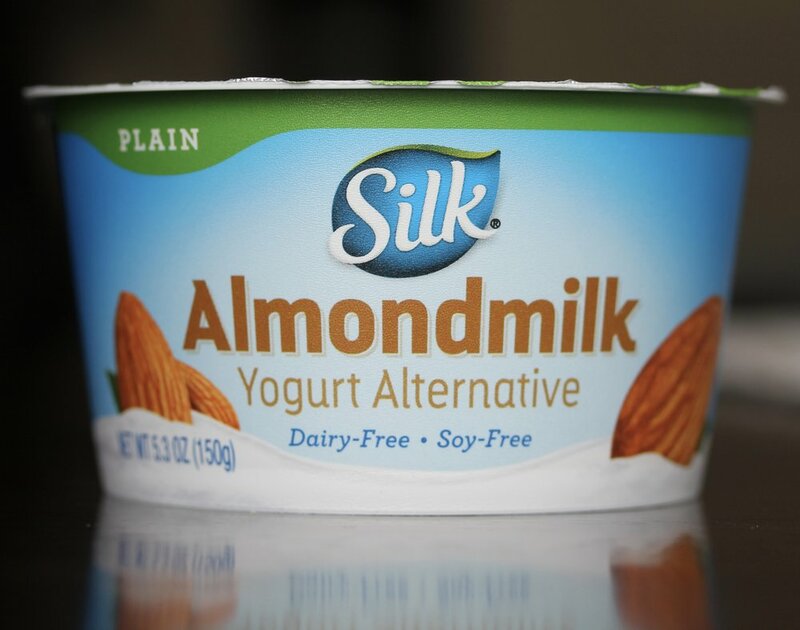 Look for a plain non-dairy yogurt with 5 or less grams of sugar per serving and limiting you consumption of high-fat yogurts to no more than 1-2 times per week. Who said salads are just for meal time!? There are no rules for which foods can be classified as snack or meal time foods. Creating a small, side-salad like dish can be a perfect snack! To save time purchase pre-washed mixed lettuce, shredded carrots, non-dairy croutons, and non-dairy based salad dressing (i.e. vinaigrette). If you’re looking for a heartier snack, open and rinse a can of beans to sprinkle on top. Done! P.S. 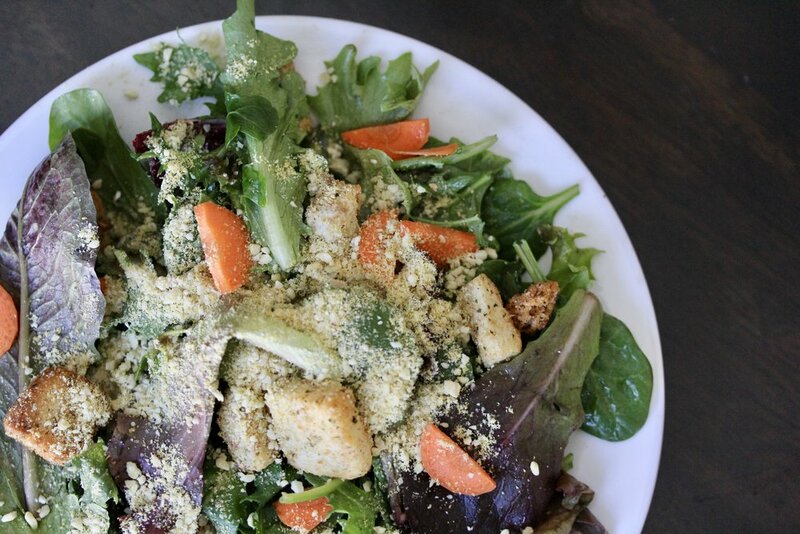 We love to add Vegan Parm to our salads. You can make this ahead of time and quickly grab it to sprinkle on your salad snack. There you have it. My top recommendations for healthy snacking. These plant-based snacks are easy to put together (or, simply unwrap) while providing great nutrition to carry us through until the next meal time. Don’t forget to be mindful of when you are snacking to make sure you are truly hungry--not just thirsty, bored, or simply eating out of habit. Let me know: Do you have any favorite healthy, plant-based snacks? *This post is not sponsored in anyway by Larabar, KIND, Silk, Mary’s Gone Crackers, or That’s It. These recommendations and opinions are my own. This post does include affiliate links, see more information regarding affiliates at “About Wholesome”.